Properties must be brought back into use within the agreed project timescales and made available to rent within 12 weeks after the project has been completed (or marketed for sale). We would suggest that you download and read the loan guidance booklet, as this will give you important information on how the scheme works and what conditions you will have to meet to be eligible for a loan. 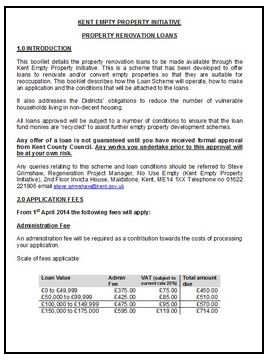 Formal application packs are obtainable on request from the Programme Manager or Project Officer for No Use Empty at Kent County Council.